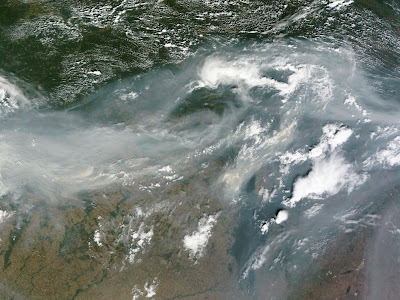 Hundreds of fires burned across western Russia on August 2, 2010, but it is the smoke that conveys the magnitude of the disaster in this true-color image from the Moderate Resolution Imaging Spectroradiometer (MODIS) on NASA’s Terra satellite. Dense gray-brown smoke extends across the width of this image, a distance of about 1,700 kilometers (1,000 miles). The smoke clearly continues both east and west beyond the edge of the image, and is visible in both previous and successive orbits of the Terra satellite. The smoke is so thick that it is not possible to see the ground beneath it. Are these massive uncontrolled forest fires or something more sinister? What happened on Aug.2,2010? Yes, it is about forest fires stoked by Russia's worst heatwave in decades. So far more than 40 people have died and about 2,000 families have lost their homes to these forest blazes. Russia's leaders have declared a state of emergency in seven provinces.